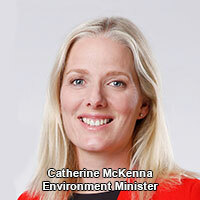 Environment Minister Catherine McKenna is holding town halls across Canada in an effort to gather public feedback on the issue of climate change plan and how best the Canadian government can act on its obligations under the Paris Accord. McKenna's town hall, Wednesday May 25th at 7 p.m. in the Canad Inns Fort Garry on Pembina Highway, was part of the townhall process for Canada's participation in the Paris Accord and to hear Canadian's advice. Terry Duguid, Liberal MP for Winnipeg South, hosted the event. Prime Minister Justin Trudeau formally added Canada's signature to the Paris Accord in April but most environmental commentators have said fulfilling it will the be hard part. Canada's nowhere near meeting targets to cut Canada's greenhouse emissions by 30 per cent let alone for 1.5degress Celsius ceiling on warming. The townhall in Winnipeg was packed and pretty much standing room only in the cramped dining room on the basement of the Canad Inns Fort Garry. So many people showed up that the stairs and antechamber leading outside the doors of the townhall were jammed with people. 350.org had bussed in 40 people.to the event. Among the crowd were unions and representative from many environmental groups as well as First Nations and Metis leaders. Several NDP MLAs made and appearance, including Wab Kinew, no Manitoba PCs appreared to be in attendace. The Green Party of Manitoba was there in force with Green Party leader James Beddome, Dave Nickarz, Signe Knutson and Kelly Whelan-Enns among others attending. It is unclear whether Minister McKenna understood that what she was witnessing was an educated public who understood there was far more to dealing with climate change than her power point presentation suggested. Minister McKenna, in her closing remarks after 30 tables provided recommendations, told the diverse crowd of Winnipegers her mind was blown. She congratulated everyone for the passion and ideas.